The best reason to shop on GoAuto.ca is choice. We have one of the largest vehicle inventories in Canada, and a 24/7 team of personal shoppers to help you compare vehicles, find the best deals, book appointments, and more. Shopping for a vehicle doesn’t have to be stressful. At Go Auto, we make the process as easy as possible. With your free Go Card, you earn $500 every time a friend you’ve referred buys a vehicle with Go Auto. It even gets better: the Go Card also lets you save at least 10% on every service, parts, and accessory bill at any Go Auto location. Get Financed Even if the Banks Say "No"
Our in-house finance company, Yes Plan Financial, has helped us finance more than 300,000 people over the past 10 years. With Yes Plan we can get you approved without having to rely on the banks. If they won’t approve you, we’ll do it with our own money. Get a financial solution that meets your needs and be back on the road, fast. Our 24/7 customer service team is happy to help with all of your automotive needs. We'll answer any questions you might have about the buying process, any services you might need, how to get financing and insurance, and everything in between. Chat with us live on GoAuto.ca, send us an email, or call 780-777-7777. 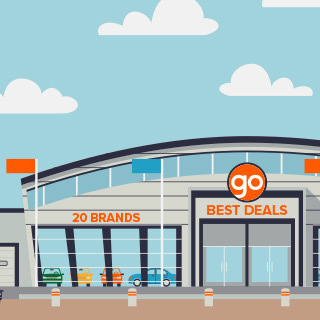 Go Auto represents 19 different vehicle brands, from domestic, to import, to luxury. That’s why we’ve put together a Best Deals page to help you decide what to buy. We update our Best Deals page every month. That way, you’ll always know where to find the biggest sales, the lowest rates, and the cheapest prices.